I don’t know about you but during the summer food not only tastes better, it looks better too. Maybe it’s because we’re outside more in the nice weather, enjoying the late evening sunlight as it slowly recedes into the horizon. We feel more relaxed and at ease. Maybe it’s because of all the fresh produce from the garden that is allowed to ripen to perfection before being picked. It’s all about the sunshine. The sunshine not only ripens the fruits and vegetables it ripens us as well. Tonight we hung out at my sisters house while the kids enjoyed an evening swim in her pool. 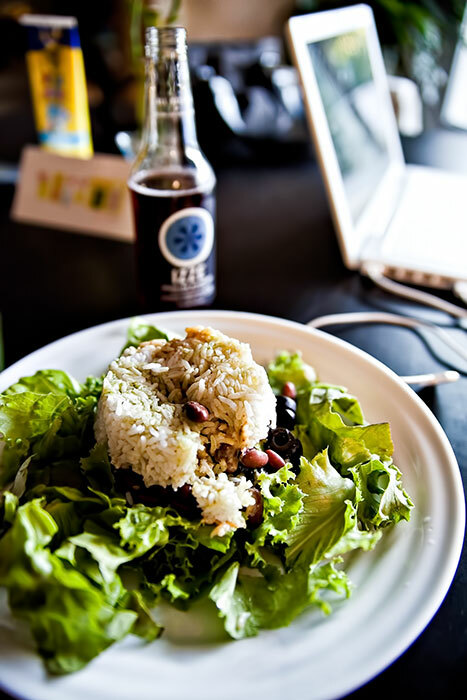 She prepared her dinner which consisted of rice, beans and olives on a bed of freshly picked garden grown lettuce. All enjoyed with an Izze sparkling juice drink. I took this shot with all natural light from an open window directly camera right. Because the light was a bit dim I used an ISO of 1600 which for the Canon 5DII is not really a big deal. It does quite well with higher ISO. I’ve shot at ISO 3200 before and had usable images. I also used an aperture of f/2.8 which created a shallow depth of field thus blurring the background and putting emphasis on the plate of food. What fresh fruits and vegetables are you either growing or eating this summer?